February 29, 2012  Hilary Clinton called what appeared to be a diplomatic breakthrough a "step in the right direction." 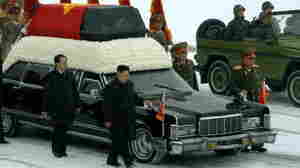 The agreement comes months after the death of North Korean leader Kim Jong Il. December 29, 2011  The North Korean Central News Agency apparently deployed its latest weapon — Photoshop — to digitally remove a small group of mourners from the left edge of the funeral photo. 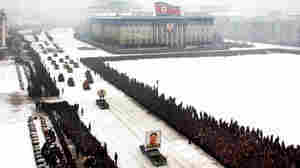 The people watching Wednesday's procession were replaced by pristine snow. December 29, 2011  The young heir to the familial dynasty that has ruled the nation since 1948 was very publicly proclaimed to have taken his father's place. 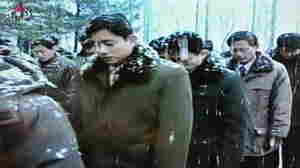 Kim Jong Il died on Dec. 17. 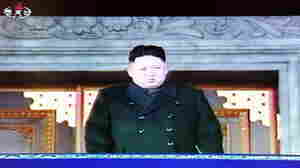 December 28, 2011  Carefully crafted images of new leader Kim Jong Un walking beside his father's casket are aimed at telling the world that a stable succession is underway, experts say. December 27, 2011  Wednesday's service is shrouded in mystery. Nations around the world will be watching for any clues about the country's future. Meanwhile, the heir to Kim Jong Il's leadership post showed a rare bit of emotion earlier today. December 21, 2011  While North Korea's official news agency has been reporting about widespread grief following the death of Kim Jong Il, the first descriptions from a foreign diplomat offer a slightly different view. 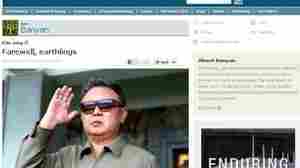 December 20, 2011  North Korean state media are praising Kim Jong Il's chosen heir and bestowing him with titles — signs that party leaders in the communist state are standing behind the plan for him to succeed his father. December 19, 2011  The guarded reaction of the Obama Administration to news of the death of Kim Jung Il, the North Korean dictator, compared with the less diplomatic language of the Republican presidential candidates Monday underscored the differences between governing and campaigning. Candidates for the Oval Office often have a freedom that presidents don't have. Who Is Kim Jong Un? Who Really Knows? December 19, 2011  The "Great Successor" who is in line to succeed his father as leader of North Korea is thought to be in his late 20s and to have gone to school in Switzerland. He may speak English. But as with many things in North Korea, much is a mystery. December 19, 2011  Known for its sometimes irreverent way of illustrating world events, The Economist magazine has over the years been quite creative when it's cover subject was North Korean leader Kim Jong Il (who died Saturday at the age of 69). It's done it again. 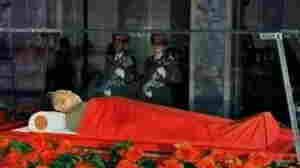 December 19, 2011  With Kim Jong Il's death, the communist nation's leadership is in transition. 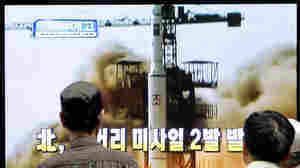 And the anxiety and uncertainty was underscored this morning with word from South Korea that the North test-fired some type of short-range missile today. December 18, 2011  The North Korean leader, who took over after his father died in 1994, was 69. He had been preparing one of his sons to be the next leader of the communist nation. October 19, 2011  Talks are set to happen next week, according to several news outlets. 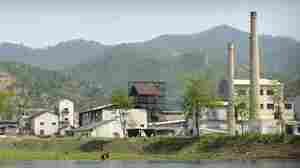 July 15, 2011  North Korea's exports include illegal drugs, counterfeit U.S. dollars and giant statues.